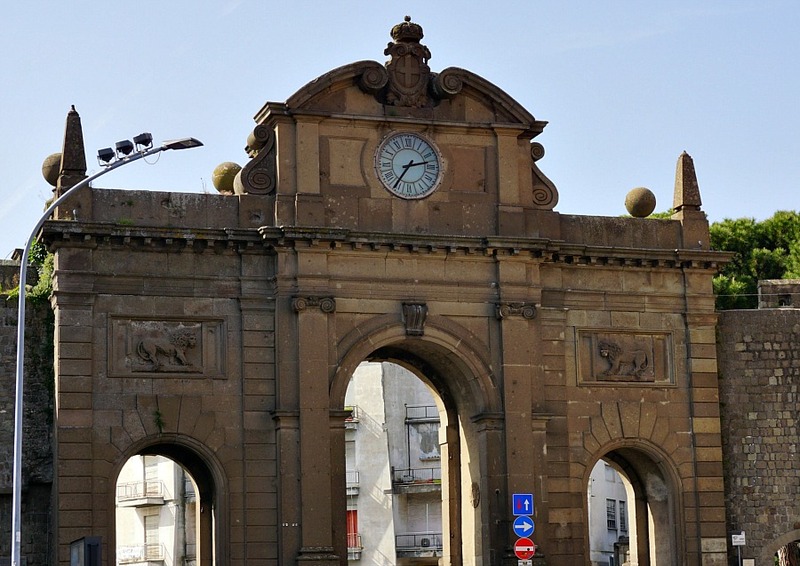 In Italy, about midway between Florence and Rome, lies the province of Viterbo. The region doesn’t receive a great deal of attention from travel sites and guidebooks, but it is dotted with small cities and towns with history that extends back well before Roman times. Many of these towns were built on top of high rocky hills, making their occupants that much more safe from attack from invaders, and further preserving their history. Today, exploring these towns means ducking behind high stone walls and wandering through narrow cobblestone streets that look as if they haven’t changed since Medieval times. 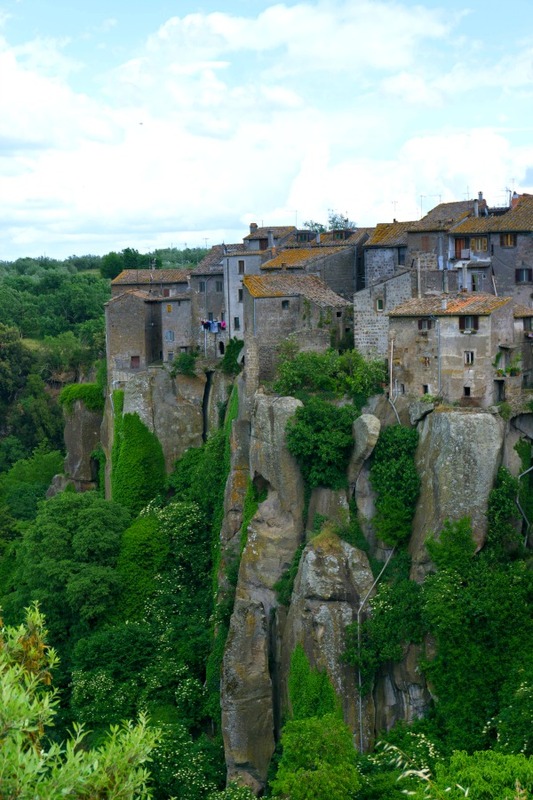 Many of the towns were originally built by the Etruscans, the precursors to the Romans in this region. The Etruscan civilization existed here from before 800 BC, and our knowledge of their origins, language, and customs are largely lost to history. What is known is the Etruscans were successful traders and builders; their hilltop cities were often built on steep promontories to be easily defended from invaders. They were, however, eventually absorbed into the Roman Empire. Each of these towns has its own legends, stories, and histories, and it’s certainly worth visiting a few, or all of them, to discover their unique offerings. With a car, you can map out a trip to explore four or five towns in a day, or just pick one, sit in a quiet cafe, and watch as modern life in an ancient hillside town strolls by. Viterbo, the capital of the province of Viterbo, is one of the few ancient cities in this region not built on a significant hill or mountain. One of the most distinctive things about the city is that it is still surrounded by intact city walls, which were built during the 11th and 12th centuries. You enter the old city through one of huge gates, many of which have been expanded to allow passage of cars. The historic center is one of the best preserved medieval towns of central Italy. Wandering through the center, you’ll notice many external staircases (called “profferli”), which were a common feature of medieval houses. These unique features are clearly a source of pride for the local residents, who decorate them with planters with brightly colored flowers. Some of the most beautiful and well-preserved profferli can be found in the San Pellegrino quarter, a section of virtually untouched Medieval streets and buildings. In the Piazza San Lorenzo, the Palazzo dei Papi (Papal Palace) is one of the main attractions of the old town. While Viterbo had humble beginnings, it grew significantly during 12th and 13th centuries, a period of particular feuding and struggle for nearby Rome. For about two decades in the 13th-century, this palace was the home of the Pope, and served as both country residence and a refuge in time of trouble in Rome. During this time, Viterbo grew to a size bigger than Rome itself. Viterbo also has a dubious distinction of the location of the longest Papal election in history. In 1268, cardinals dutifully assembled in the palace to elect a new pope, but after a year and a half they still hadn’t managed to choose. The frustrated local population locked the cardinals in their conclave, feeding them only bread and water until they decided among the candidates. For further encouragement, the magistrates of Viterbo even removed the roof of the palace. Eventually the cardinals made a choice, but in all it took almost three years. Many of the older buildings, particularly the churches, are built on the ruins of older structures. 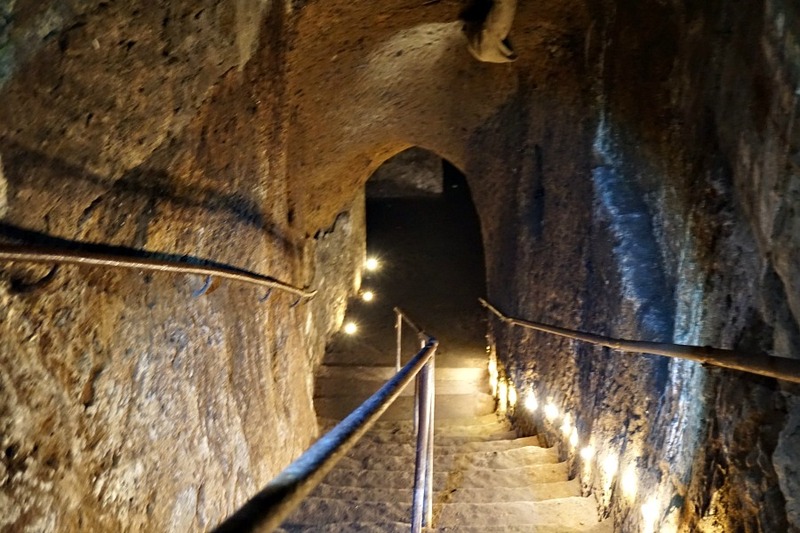 You can explore some of the underground history by visiting “Viterbo Underground.” For a few euros, you can take a (short) self-guided tour a few meters below the surface, into the caverns beneath the city. The underground passages have been used throughout the years for everything from wine cellars to storage to bomb shelters during World War II. Viterbo is also home to Tuscia University, so you’ll find plenty of students, as well as coffee shops and pubs throughout the town. There are also some unique (non-medieval) art emplacements in the student areas, which have received mixed reviews from the locals. 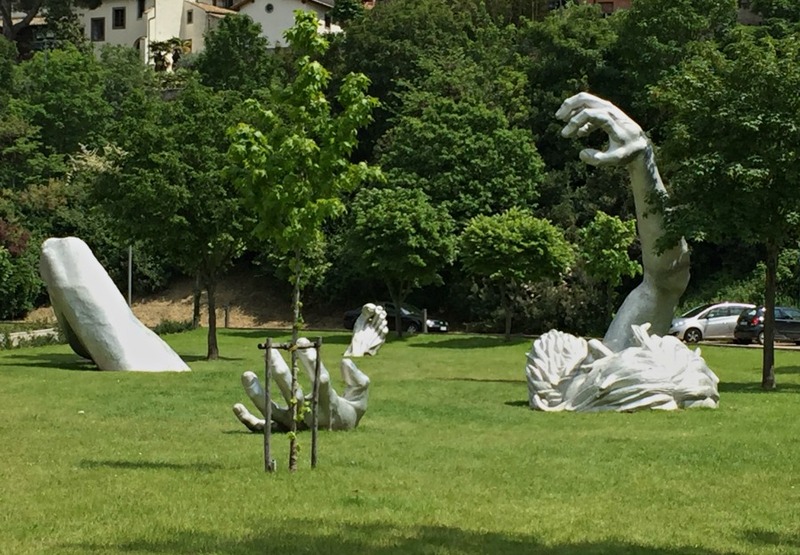 “The Awakening” by Seward Johnson is one of these installations: is a giant sculpture depicting a man buried (or emerging) from the earth. The thermal baths are a big draw to Viterbo. Terme di Papi (Bath of the Popes) is a high-end spa constructed around the remains of a Renaissance bath palace. The baths have an even longer history, with the original bath structures dating back to Medieval times. One of the most renown thermal spas in Italy, Terme di Papi provides a free shuttle for visitors from Rome for a day at the spa. But the high-end (and potentially high-priced) spa isn’t the only option if you want to soak in the hot and relaxing thermal waters. There are a number of public baths that offer a less pampered soak. Piscine Carletti, Bagnaccio, Bullicame, and Masse de S. Sisto a few of these. 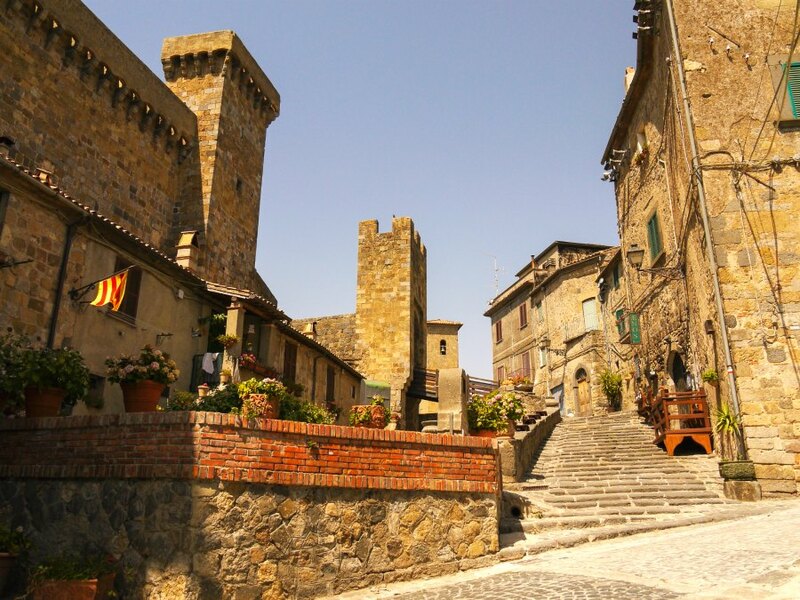 To enter tiny town of Bagnaia you cross a high bridge that may remind you of a drawbridge, without the “draw” part. The bridge is abutted by the Church of San Antonio Abate and the Castle gate as you enter the old center. Today, the ancient public fountain in the center of the square is still the gathering place for locals. Any time of day you’ll find people gathered in the square around the fountain, chatting, reading the newspaper, or just sitting on the benches watching the happenings in the square. The restaurant Il Borgo dominates the town square, and is a natural gathering place, constantly filled with people sipping coffee at breakfast or sipping local wine late into the night. The restaurant is deceptively larger than it appears, with two seating rooms inside beyond the outdoor patio. You’ll likely find the owner’s family seated at one of the tables, greeting diners and usually having their own daily meal on site. 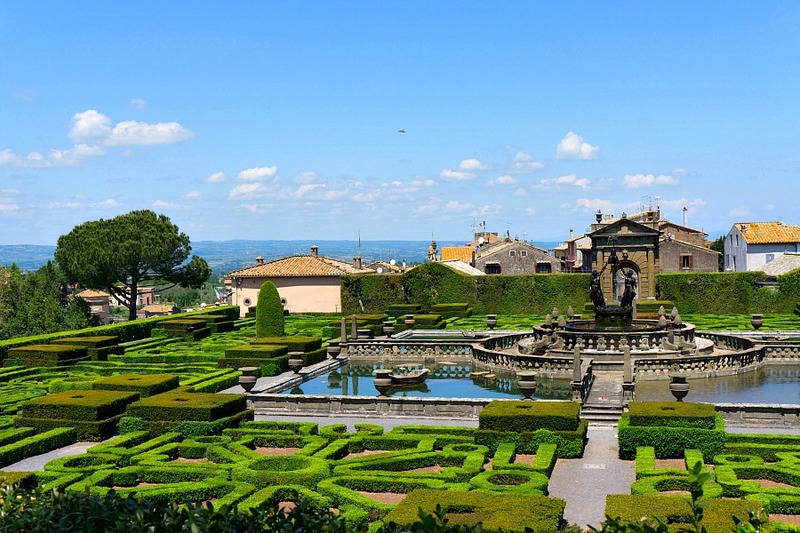 The big draw to visit Bagnaia is the estate of Villa Lante at the top of the town. This gorgeous estate is open to the public, and for a small fee you can wander through the ornate and well-preserved gardens. The property is dotted with water features, fountains and grottoes, with the water flowing down the incline from one feature to the next. 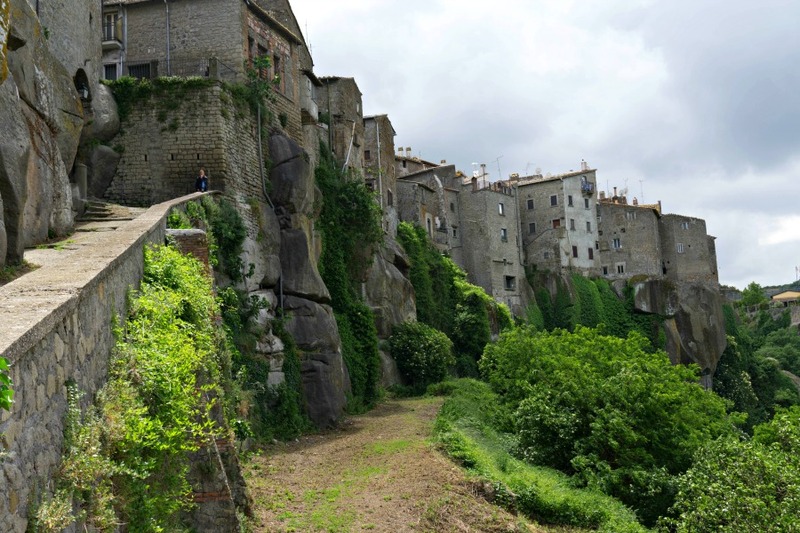 The hill city of Bomarzo is a densely populated town with steep narrow streets that provide a great workout while exploring. Many people skip the town itself, though, instead heading to the Park of Monsters on the outskirts. The Bosco Sacro (Sacred grove) or Bosco dei Mostri (“Monsters’ Grove”) is unlike most parks you’ve ever seen. Follow the twisted paths through the green canopy of leaves, and you’ll come across some truly incredible (and somewhat disturbing) huge stone statues. The sculptures, carved out of volcanic rock, are inspired by literary stories, Greek mythology, and the imagination of their creator. Some of the more incredible larger than life pieces include The Elephant, showing Hannibal’s elephant assaulting a Roman legionnaire, Hercules Slaughters Cacus, depicting two giants in a battle to the death, and the strangely offset Hanging House. One of our favorites is Orcus (Ogre), a massive, frightening head with an open mouth large enough to walk through. On the upper lip is inscribed “All Thoughts Fly”. The meaning is evident when you speak once you’ve stepped into the cave-like interior: whispers made inside are easily heard by anyone standing outside. Although, it’s far more fun loudly groan or moan, and let the reverberating sounds spook anyone in that section of the park. 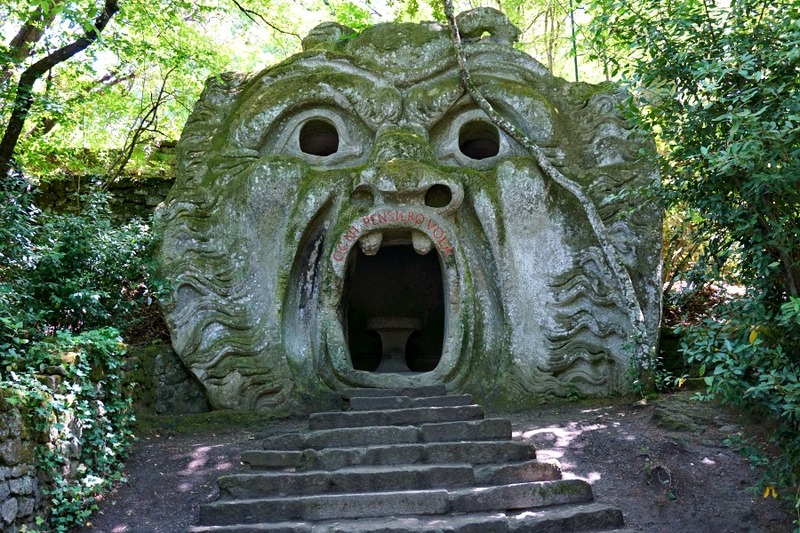 Monster Park was created by Vicino Orsini, the lord of Bomarzo, in the mid-sixteenth century, who had an obsession with the weird and the eerie. The haphazard layout of the statues and the paths are almost a direct affront to the sedate and organized formal gardens that many of the nearby estates embrace. The park actually fell into disrepair and was largely forgotten until this century. In 1954, Giovanni Bettini bought and painstakingly park restored to its original glory. Bolsena a small resort town on the edge of Lake Bolsena. It is believed to have once been the Etruscan settlement of Volsini, and ruins of a settlement can be found on the hill above the old town. The Romans destroyed the original city and evicted its citizens. Under Roman rule the town grew back to an even greater size, even gaining its own amphitheater, which is visible today. The town is dominated by the Fortress Rocca Monaldeschi, built by the powerful family that ruled this area during the 14th century. 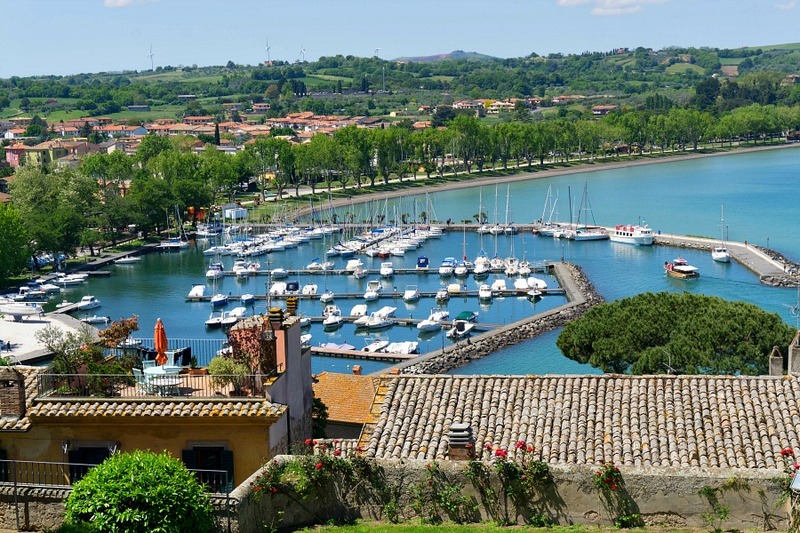 Bolsena is also known as town of miracles. The patron saint of Bolsena is St. Cristina, the young daughter of a powerful magistrate in Bolsena during the 3rd century. Cristina’s rejected her father’s pagan faith, and embraced Christianity after having a vision of a visitation by an angel. 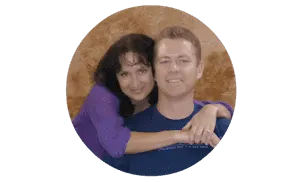 As a result, she was beaten and tortured, and although her torture included being burned and placed in an oven, she survived each ordeal and each night would be miraculously healed. She was eventually dispatched by sword by the new magistrate who replaced her father, but not until she had converted 300 locals to her faith. But that wasn’t the end of Cristina’s effect on Bolsena. The town straddles the Via Francigena, one of the main routes during the Middle Ages for pilgrims on their way to the holy lands. The next miracle occurred when a priest on his way to Rome, who was struggling with his faith, stopped to pray at St Cristina’s tomb. As he finished praying, blood began to flow from the tomb, staining the surrounding stones: a miracle! Following this even, Bolsena became an important shine and stop for other pilgrims. Today the events of the miracle of Cristina are celebrated in the annual flower festival called the Infiorata on the feast of Corpus Christi. For the festival, locals build a two mile long carpet made of fresh flower petals arranged in intricate designs. Marta is a small village on the southern shore of Lake Bolsena. The town is perched on a hill and descends gently to the shores the lake. Marta is characterized by narrow streets and picturesque corners, dominated by a magnificent octagonal clock tower. Locals recommend trying a traditional dish in one of the restaurants that overlook Lake Bolsena. Scafata is a a very popular vegetable stew filled with simple ingredients like fava beans, Swiss chard and onion. Another favorite is the acquacotta (literally, “cooked water”) a very simple broth-based soup with stale bread that was originally a peasant food and traces its origins back to Etruscan times. 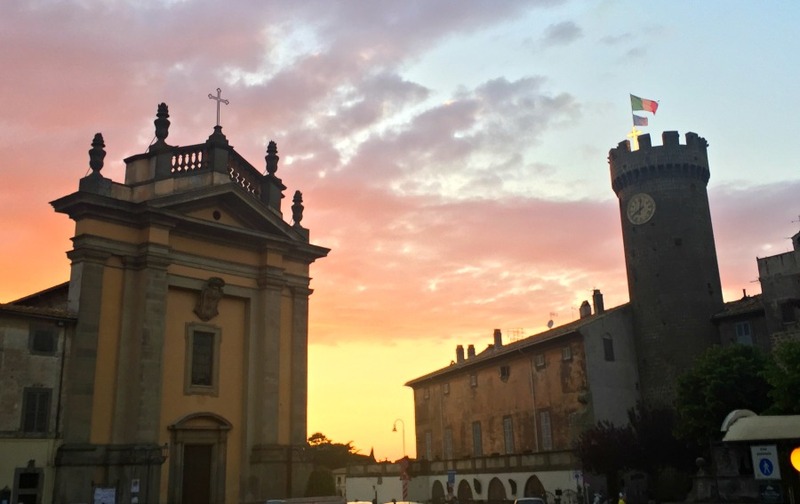 In May, Marta hosts the Festa della Madonna del Monte (also known as “Barabbata”), a huge festival which runs from the night of May 13th through the festival day of May 14th. Processions of massive carts filled covered with flowers filled food close the streets of the town through the day. The village of San Martino al Cimino grew up around the Cistercian Abbey, originally built by French monks in the early 13th century. After entering the village through the imposing main gate, a steep hill lined by residential homes leads to the abbey. The gothic-style abbey is austere-looking from the front, but the back of the building has a unique polygonal apse of stone. The interior is simple and austere, reminiscent of other Gothic cathedrals and Cistercian abbeys with a high cross ceiling, large windows and colonnade pillars. The abbey is connected with the nearby Palazzo Doria Pamphil by a corridor built over an arch that connects the cloister with the square behind the abbey itself. A visit to the small village of Sutri must include three stops: the Roman amphitheater, an Etruscan necropolis, and the Santa Maria Del Parto cave church. The elliptical amphitheater is cut of the rock, and it’s believed that its main use was for viewing processions from a standing position. The necropolis consists of multiple tombs that can be seen on several levels. Sixty-four tombs can be seen in all. Over the years, the necropolis was raided for treasure, but also used for various purposes by pilgrims walking the Via Francigena to the holy lands. The Madonna del Parto cave church was originally an Etruscan tomb, carved into the tufa stone. Around the 3rd century A.D. it was converted to a Mithraeum, a place of worship for the followers of Mithraism, a religion centered on the god Mithras. After Mithraism was absorbed into Christianity in the 4th century, was converted into a church in honor of Our Lady of the Virgin Birth (Modonna del Parto). 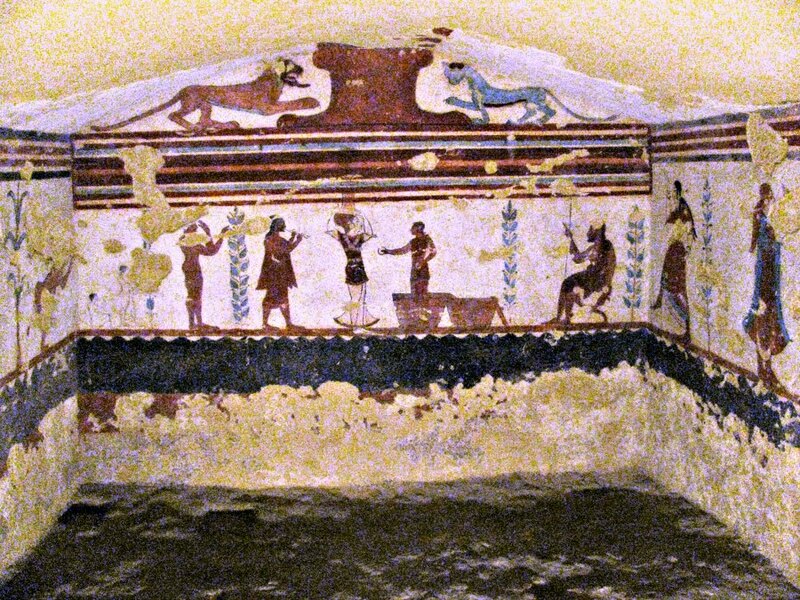 Partially preserved colorful frescos remain on the walls of the rooms of the cave. 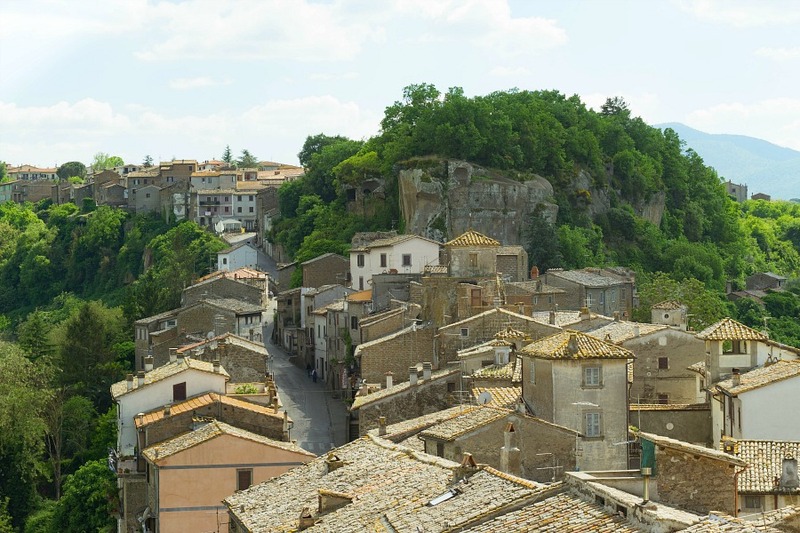 A few miles from the coast of the brilliant blue Tyrrhenian sea, sits the city of Tarquinia. 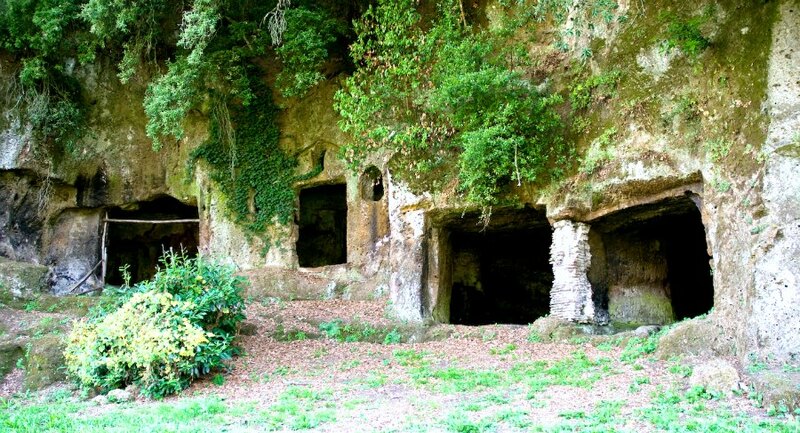 Once one of the most important and powerful cities in Etruscan lands, it is now known for its ancient Etruscan tombs. The tombs lie in the widespread necropoli (or cemeteries) that the city sits atop, and for which the site was UNESCO World Heritage status. The earliest of these tombs date to the 7th century B.C. The burial site contains several different types of tombs: burial mounds of earth and stones called tumuli, simple trenches cut in rock, and far more detailed tombs of rocked carved in the shape of houses and other structures. These last provide the only surviving evidence of residential architecture in Etruscan civilization. You can visit a portion of the main necropolis which contains 6,000 tombs, 200 of which include beautiful wall paintings. These paintings are incredibly well-preserved and give excellent insight into a society most of whose history has been lost. The paintings show evens of daily life include banquets and sporting events. There are also mythical/religious depictions of demons and the afterworld, and also paintings of members of important families who were buried there. Evidence suggests that Tuscania has been inhabited since the Neolithic times but the main town was built around the 7th century BC. During the Etruscan times, Tuscania gained much importance due to its strategic location, and became one of the richest centers in Etruria. Two churches in the old town our worth visiting. The church of San Pietro in Tuscania is thought to be one of the most beautiful churches in the region of Lazio. The church of Santa Maria Maggiore, built during the middle ages, is quite small in size but has an interesting faí§ade. The Etruscan museum outside of the old town has a large collection of the items that were found in the nearby areas that are dating back to the Etruscan times. Located in the former Franciscan convent Santa Maria del Riposo, the museum houses many of the objects saved from Etruscan tombs that dot the area, including several sarcophagi. 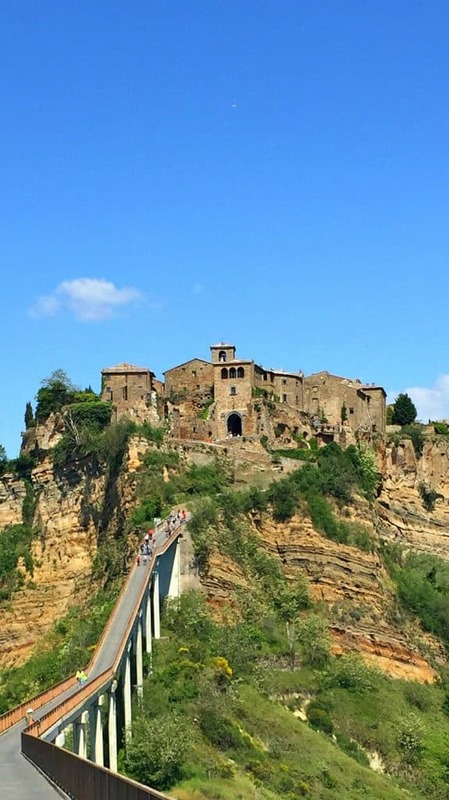 Two key stops in Civita Castellana are the fortress and the cathedral. Forte Sangallo (the fortress, or citadel) was built by Pope Alexander VI and completed by Julius II with the erection of an octagonal keep. In the early 19th Century the fortress was the main prison for northern Lazio.. It ended up housing many Italian patriots, leading to it becoming known as the Papal Bastille. The Cathedral of Santa Maria Maggiore has some incredible examples of Cosmatesque floor and facade mosaic work. The intricate patterns on the floors are created from thin slices cut from colored marble and columns found in ancient ruins. The name derives from a Roman family Cosmati, who were renown for their expertise in mosaic work. Other work from the Cosmati family can also be found in Rome, Anagni and Spoleto. Vitorchiano is famous for the grey stone of which the buildings are constructed. Built on a triangle-shaped outcrop of massive Peperino rocks, and protected by deep ravines on all sides. Vitorchiano has the compact and unique look that define hill towns in this region. After entering through the Porta Romana gate, you will find Mary’s church and the Saint Agnes Nunnery facing each other across main square. The church has a lateral bell tower and two decorated entrances. The bell tower is unique. It is detached from the main building and has different types of windows, with one light, two lights and three lights. The nunnery dates back to 1466. The snow gate provided the only access to buildings constructed for the defense or military purposes in Vitorchiano. According to legend, the gate received its name due to the snow gathered on the gate in the month of August. On the gate you can find a coat of arms and various inscriptions and messages. Vitorchiano just calls out to be explored. It deserves being explored via a walk through the ancient streets, where you can find breathtaking vistas from the view spots built onto the sheer rocks. Located a promontory on Lake Bolsano. The lake is the dominant feature of Capodimonte. A long beach of volcanic sand with Italian gardens on each side is the most photographed view of the tiny town with less than 2,000 inhabitants. The Villa Farnese (or Villa Caprarola) is a huge mansion that dominates the surrounding country-side, and is the central feature of the town of Caprarola. The villa was built on the ruins of an ancient castle for the Farnese family in the 16th century. It has a unique, five-sided pentagon design, with a central garden. Imposing in its position over the surround town, the villa is often cited as one of the finest examples of Renaissance architecture. The main villa today is open to the public. The gardens and the summer-house attached to the villa are currently one of the homes of the President of the Republic Italy. 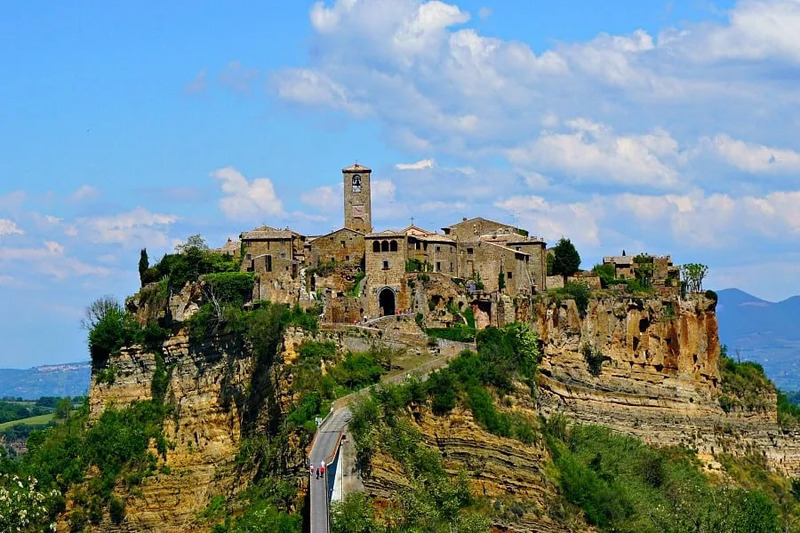 Civita is called the “Dying City” due to its location on a high plateau that has been steadily decaying through erosion. The buildings on the outer edge are in danger of falling off the edge as the brittle material that is their foundation falls away. But, don’t let the name make you think this is a ghost town – the town is a bustling spot filled with restaurants and shops, enjoying its recent resurgence as a tourist destination. On our visit, we met a traveling couple who were in the process of landing their radio controlled drone, They were able to take video of the entire town from above. While we don’t do drone videos, I have to admit a little bit of envy. If there was ever a place where a drone video would have made a huge statement, this was it. There are no vehicles allowed in town. To visit, you need to park and walk on foot across the high bridge that is the only access route. The walkway climbs steeply at the end as you enter the town, so be prepared for some exercise. Once in town, you’ll be rewarded with a pristine Medieval village, virtually untouched by Renaissance developments.There are a surprising number of restaurants and small B&B’s for a town this size, a testament to the fact that most of the dwindling population cater to tourists. The main piazza is the center of the town, both in geography and in society. Locals and tourists alike gather here at night to socialize. The square is also the location for donkey races on the first Sunday in June and the second Sunday of September – yet another reason to visit! 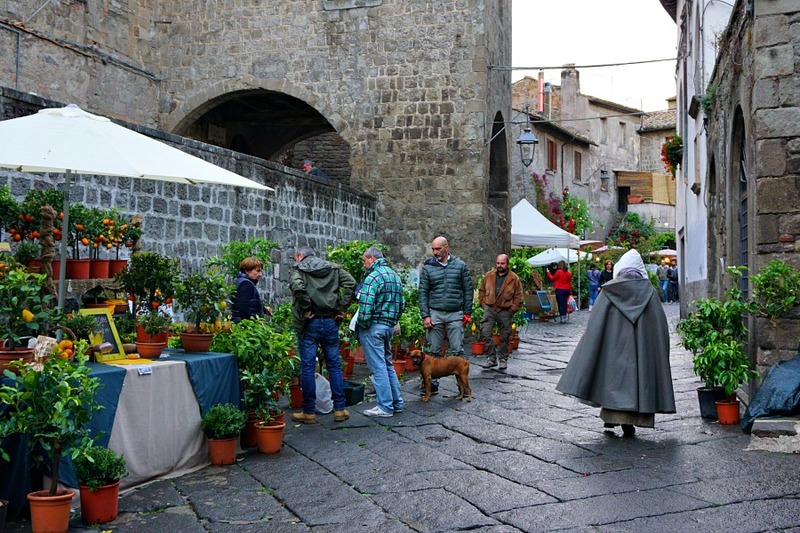 Well-known traveller and tour guide Rick Steves has referred to Orvieto as “What an Italian Hill Town Should Be”. Perched high on tufa cliffs above the valley (and newer town) a thousand feet below, the castle fortress was clearly built with defense in mind. Between the drawbridge, moat, and sheer rock walls, the city would seem impenetrable to invading forces. The tufa land on which Orvieto is located is filled with caves, tunnels and wells that date back as early as Etruscan times, although many excavations are only a few hundred years old. The passages have been used for many things over the centuries. One of the most fascinating is their potential for escape during times of siege. Most wealthy families through history had their own secret underground tunnels that would lead them well away from hilltop city to the safety of the countryside in times of war. 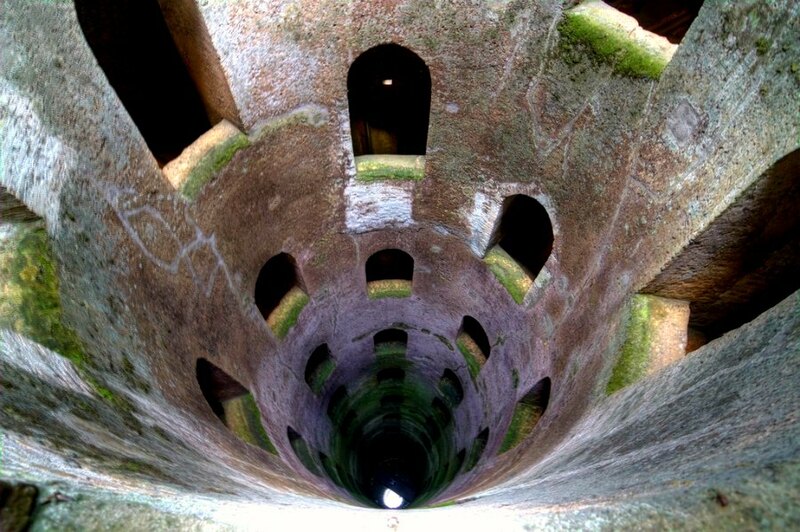 One of the most spectacular of all the excavations is the Pozzo di San Patrizio, a deep well with a double spiral stair leading to the water source at its base, 62 meters below. Built in 1537, it is still in use today – but for a different purpose. Exploring tourists are allowed to make the descent (and the returning ascent) to experience what life was like during the periods that this was the only source of water. They don’t, however, need to carry full buckets of water on the way back up. Scholars estimate that Amelia, is the oldest town in Umbria. 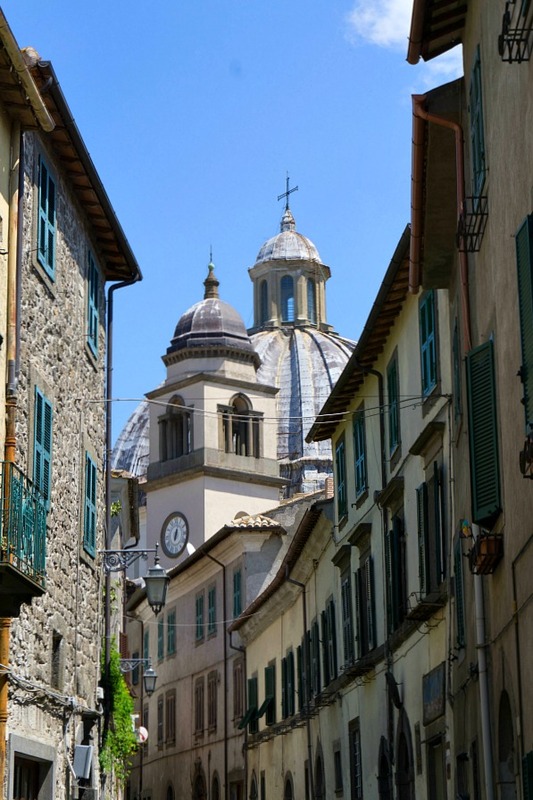 Legend states that it was founded by a noted Umbrian king, King Ameroe, who gave the city the its name. Some histories (which aren’t really considered accurate) place it’s founding as early as 1134 BC. The current town grew up around the original fortress atop the hill. Amelia is home to a number palaces which are worth a visit. The Geraldini Palace is located just below the cathedral in old town.The interior has a number of late 16th century frescoes. The Venturelli Palace houses mosaics from the second century AD, black and white tiles in geometric designs and floral motifs. The Renaissance style Petrignani Palace was built in the 16th century, and is still unfinished. 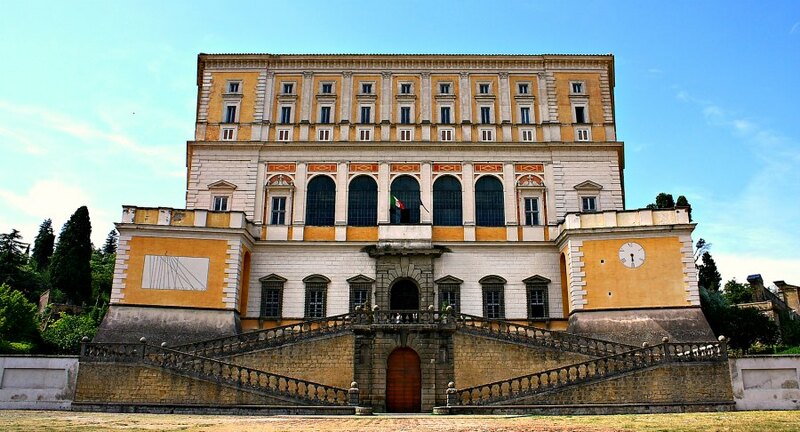 Other palaces include Farrattini Palace, the Boccarini Palace, and the Cansacchi Palace which was built on a base of Roman walls, which are still visible in some places. Montefiascone occupies the highest point on the mountain ridge on the southeast side of Lake Bolsena, and is visible from quite some distance away. The Cathedral of St. Margherita dominates the skyline of the town. The cathedral has one of the largest domes in Italy, at because of its height and position in town, is visible from most of the towns around Viterbo. The legend is that in the year 1111, Canon Defuk was traveling with Holy Roman Emperor Henry V to Rome and, as a wine lover, he insisted his valet precede him to write the word “Est” (which means “there is”) on the doors of the inns with the best wine. 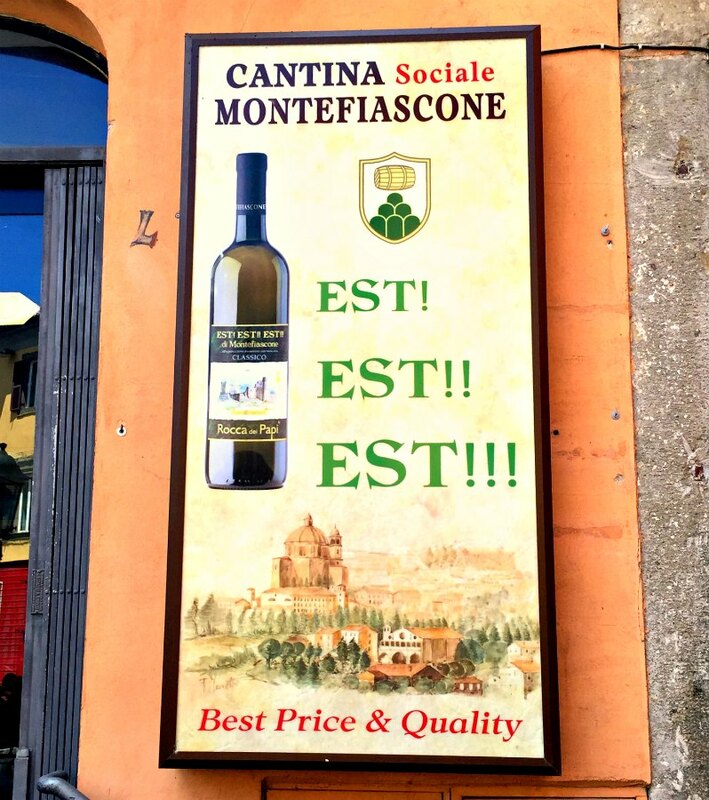 On the door of the inn at Montefiascone the valet wrote “Est” three times, and the canon fell in love with the wine to the point that he never left the town. So, if you visit, try the wine, but maybe hold back from drinking quite so much as Canon Defuk. The land on which Vetralla sits has been continuously occupied since the Early Middle Ages. A local legend says that the town dates even further back: to the Biblical figure of Noah. It is said that Noah landed his Ark on the heights here during the floods, and took advantage of the excellent wines found here to refresh himself. Questionable, maybe, but grapes do figure prominently in the towns’s coat of arms. The main sight here is the Medieval church of San Francesco, made of square blocks of the rock on which the city was built. The church contains well-preserved frescos and floor mosaics, as well as a crypt. December is the time to visit Vetralla, with two distinct festivals during this month. The first is the Sagra del Olio, in which the region highlights its olive producing history with a festival of olive oil. The second is the Christmas-time living nativity, in which hundreds of people wear 19th century costumes in a re-enactment of this time of year in the late 1800’s, highlighting the trades and activities of daily life during that time. The main landmark within Bracciano is the Castello Odescalchi, a massive castle built in the 15th century. The castle is available to visit, and is often rented out for receptions and parties. Hollywood A-listers Tom Cruise and Katy Holmes held their wedding reception here, and while that match didn’t turn out well, it’s still an impressive place to visit. As the capital of the province of Terni, this city is much more modernized than many of the towns on this list. In the 19th century it became one of the central steel mill cities in Italy, helping to lead the industrial revolution in this region. Even today, it is sometimes referred to as “The Steel City” and the “Italian Manchester”. The modern and industrialized portions surround the ancient city center dates back to the 7th Century B.C. The city center contains a Roman amphitheater, a basilica, and a few palaces dating to the 16th century. 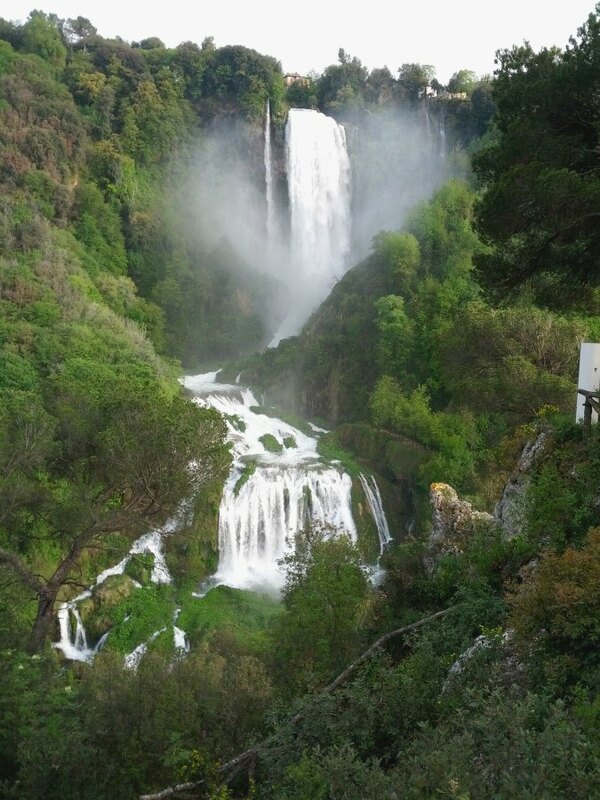 To take a break from the architecture and history, visit the Cascata Delle Marmore (Delle Marmore waterfall) just outside the city. At the point where the two Velino and Nera rivers meet, the waterfall is 165 meters in height and is a favorite picnic spot for the locals. Terni is also the birthplace of St. Valentine, protector of lovers, whose remains are preserved in the basilica and who serves as the city’s patron saint. Every year the entire city holds celebrations for St. Valentine, culminating Valentine’s day on February 14th. Of course, the city takes advantage of this and advertises itself as the “City of Lovers”, and draws in many people for this annual festival. If the name sounds familiar, CS Lewis named his fictional kingdom of Narnia in his Chronicles of Narnia series after seeing the name of Narni on a map. 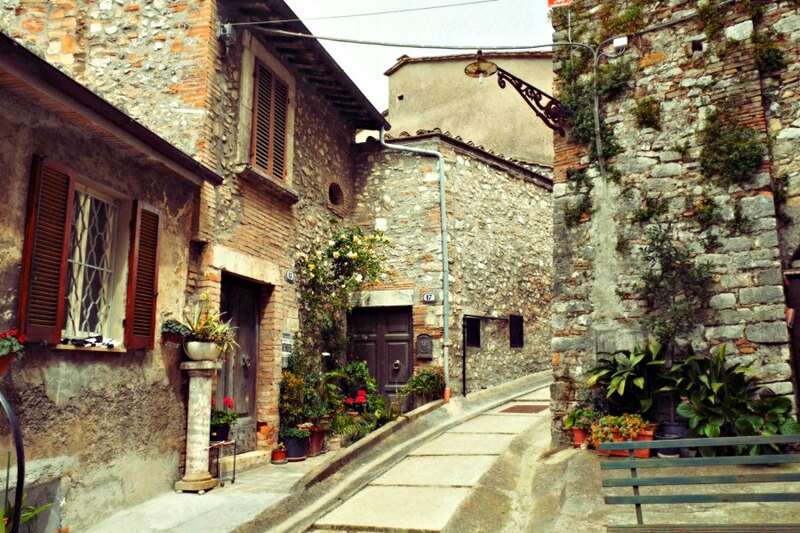 Narni is one of the best-preserved villages of Umbria, with towers, fountains, and Gothic and Romanesque churches. 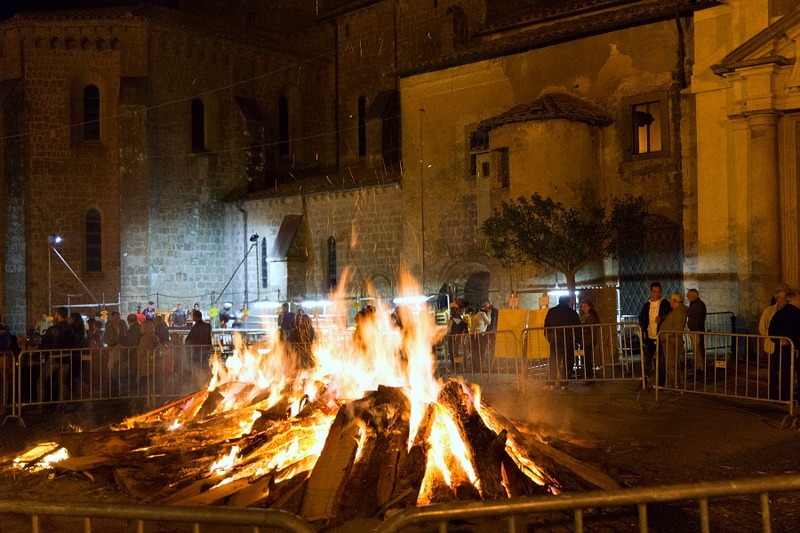 It has Medieval feel that becomes pronounced during celebrations like the Corsa all’Anello, a festival that includes a series of Medieval re-enactments from the last week of April to the second Sunday in May. The focus of the festival is the “Race of the Ring” in which horse backed knights armed with long spears race to spear a ring suspended between to ropes. Clearly, we feel these tiny hill towns, with their unique stories and histories, are well worth visiting. If you want to see them, you’ll need to rent a car, since many of the towns aren’t on easily accessible train or even bus routes. And you can’t see them all in a day or two, or probably even in a week. So you need to choose. How do you decide ;which of these towns? It’s all dependent on your preferences. Do you want to explore Roman and Etruscan history, hold hands with your special someone at romantic destination, or just soak up the local life of small town Italy? Whichever you choose, pick just a few villages and take your time: imagine life hundreds or even thousands of years ago in these places, talk to the local people whose families have lived there for generations, and discover your own stories and legends of these fascinating hill towns. Wow, these are some beautiful places. I want to see them all! I’ve never heard of them before, but each one sounds interesting and pretty. You guys are living the dream! Have fun! 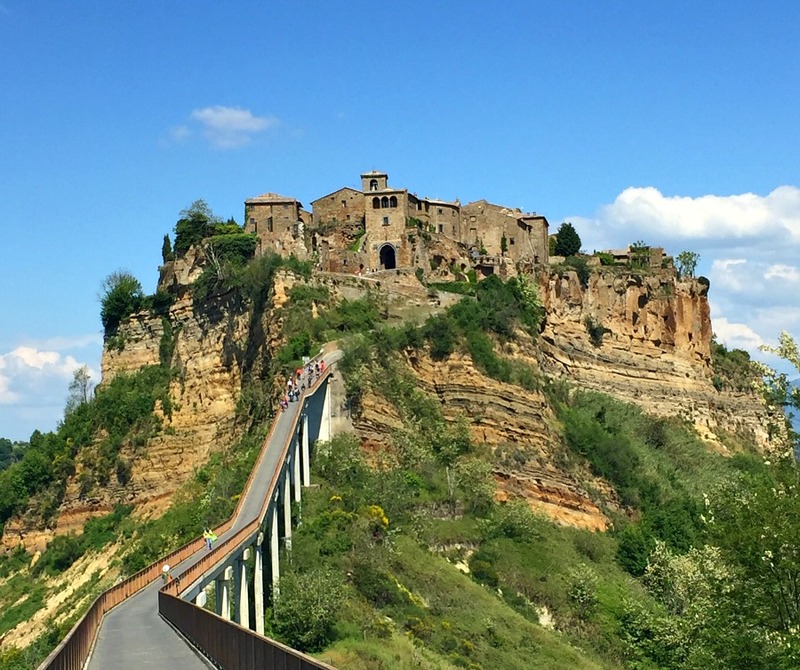 I loved visiting Orvieto and Civita. The caves below the city in Orvieto were fascinating. And there’s nothing like Civita. Possibly the most unique place I’ve been. Italy is so beautiful!! I love your pictures. They have nice hiking places up there.